Canadian businessman and television personality Kevin O’Leary is known to induce a few tears from “Shark Tank” contestants vying for his seed capital with a no-nonsense, shrewd-to the-core business style. 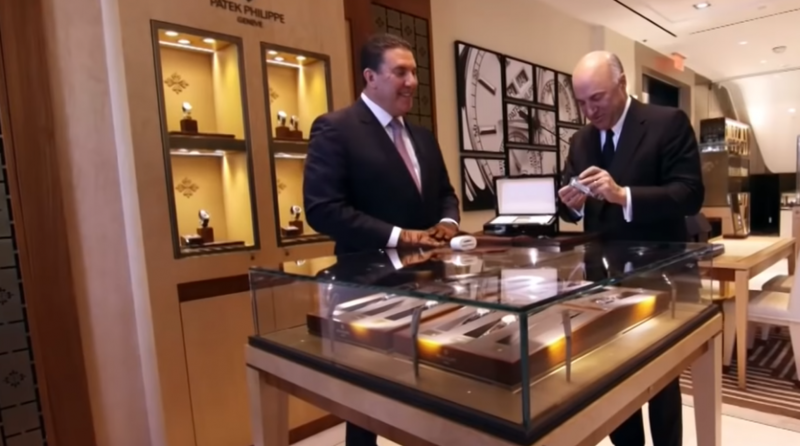 However, the tables were turned when O’Leary went shopping for his holy grail watch–the Patek Philippe Nautilus 5711/1A, which retails for over $30,000. Of course, to the average consumer, dropping $30,000 on a watch would no doubt turn on the waterworks, but for O’Leary, who boasts a net worth of $400 million, buying a watch that is equal to three times the worldwide median income is not an issue. As for the watch itself, the Patek Philippe Nautilus 5711/1A is not just any regular timepiece. It boasts an eight-year waiting list, particularly for the blue-dialed version O’Leary covets. “If you’re a watch collector, it’s at the top of your list everywhere in the world and when you see one, the aura drags you right to it. I’ve seen grown men weep in the presence of this watch and that’s never going to end,” said O’Leary. O’Leary said he’s been eagerly anticipating the arrival of the watch for over a decade. When O’Leary flies from Toronto to the New York-based jeweler to pick up the timepiece, the excitement begins to kick in.